No matter what the occasion, Sandy Wilson, as Magic Max the Magician will delight your child, and make their special day even more memorable. From the smallest living room to the largest hall, and no matter what the age, Magic Max will have your children in stitches with his unique brand of magic, tailored especially to your individual requirements. A trustworthy and dependable entertainer, Magic Max will arrive on time, and deliver a show that your children will be talking about for weeks to come. 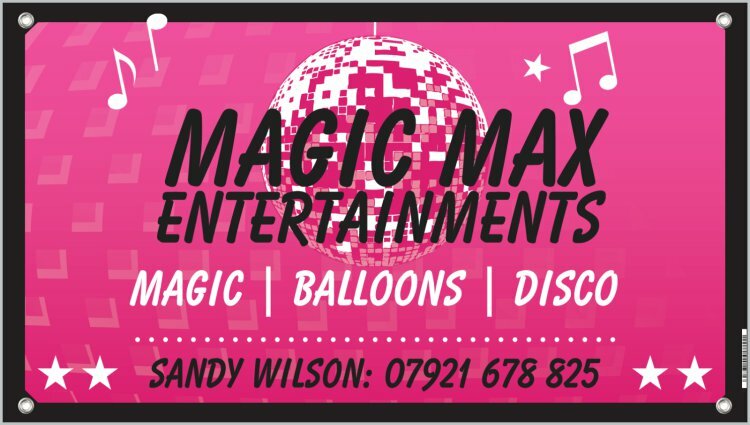 Magic Max offers a range of different affordable options, including Magic, Balloon Modelling and party games, suitable for all ages. Above all, he ensures that your party will go out with a bang, while making life as easy as possible for you. Magic Max holds full public liability insurance, and Disclosure Scotland certificate and risk assessments are available on request for nurseries, schools and hospitals.